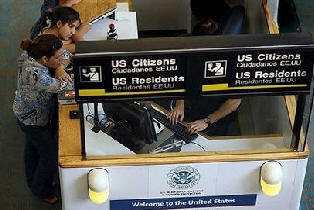 June 29, 2010 - A former U.S. Customs and Border Protection (CBP) supervisor, William Mann at Midway International Airport will be arraigned this week on federal charges alleging that he received $52,000 in bribes to allow foreign restaurant workers and their spouses to remain in the United States. These charges resulted from an investigation conducted by the Department of Homeland Security's (DHS) Office of Inspector General, and the U.S. Immigration and Customs Enforcement (ICE) Office of Professional Responsibility (OPR). William Mann, 50, a former CBP supervising officer at Midway, allegedly received about $700 to $2,000 per person from more than 30 restaurant employees and their spouses. Mann allegedly altered a law enforcement database and provided false immigration and travel documents showing that the restaurant workers and their spouses had just entered the United States and were eligible to legally stay in the country for another year. Rogerio Charu, part owner and general manager of the former restaurants in Chicago, Downers Grove and Schaumburg, was also charged with Mann. The indictment also seeks forfeiture of $52,000 from Mann, representing the alleged bribes he received from the restaurant employees. The indictment alleges that when Mann accepted the money in the spring of 2005, the employees and their spouses either already were required to leave the U.S. or soon would be required to do so. If convicted, Mann and Charu each face up to five years in prison on the conspiracy count. The three counts of bribery and aiding and abetting bribery each carry up to 15 years in prison. Each of the three counts of immigration fraud and aiding and abetting immigration fraud carry a maximum penalty of 25 years in prison. All seven counts carry a $250,000 maximum fine.